It’s a 14.5 hour flight from Los Angeles to Sydney, Australia. 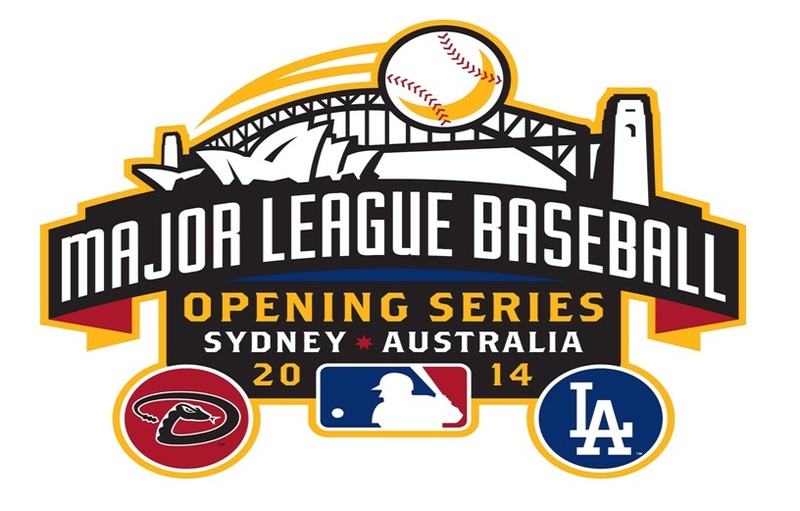 7,487 miles is a long way to go for a baseball game, but that’s just what the Los Angeles Dodgers and the Arizona Diamondbacks did to kick off the Major League Baseball season opener in the ‘Down Under’ of Australia. 40,000 Aussie baseball fans showed up at a converted Cricket field at Sydney to watch the two MLB go at it for the first time in 2014. As it turned out, the Dodgers took both games of the series and got their season off to a nice 2-0 start, which should make Magic Johnson happy anyway. The team will take a few days off to recover somewhat from the jetlag they must all have experienced and then go down to San Diego next Sunday night to take on the Padres. Imagine playing those two games under the inevitable jet lag that surely have come from the trip down there. It must have been quite an experience for guys like Yasiel Puig who just made it out of Cuba a couple of years ago. The Dodgers excellent pitching staff came through again with Cy Young Award winning Clayton Kershaw pitching the first outing followed by Japanese ace Hyun-Jin Ryu in the second game which Los Angeles won by a final score of 7-5 but only after holding off a 4 run onslaught by the Diamondbacks in the bottom of the 9th inning. Arizona starting pitcher Trevor Cahill was knocked out of the game in the fifth inning trailing 3-0 after giving up 8 hits against just one strike out. Hyn-Jin Ryu, on the other hand, threw five shutout innings and put the Dodgers up with a 5-0 lead. But the spark for the Dodgers ‘Down Under’ was, once again, Yasiel Puig. He had 3 hits and 2 runs-batted-in in the game on Sunday. Dee Gordon and Juan Uribe both added three hits bringing the Dodgers total for the day to 13. Dodgers manager Don Mattingly put Puig in the lead off position for the first game and he struck out three of the five times that he came to the plate facing a total of only 15 pitches in five at bats. He also got caught in a rather embarrassing rundown which caused Adrian Gonzalez to whisper something in his ear and Mattingly to pat him on the shoulder. Puig is still adapting to the big leagues, but his raw talent and attitude make his the most interesting new MLB player to come along in quite some time.